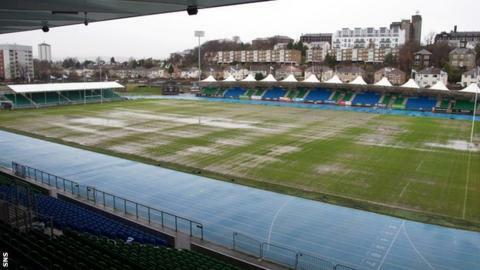 Glasgow Warriors' pitch at Scotstoun Stadium is not fit for purpose, head coach Gregor Townsend has admitted. The Pro12 champions have had two matches postponed this season because the surface has been waterlogged. And the second leg of the 1872 Cup match against Edinburgh was switched to Murrayfield. "If we had a home game this weekend, we wouldn't be able to play," said Townsend ahead of their European Champions Cup game away to Racing '92. ''It's frustrating, disappointing. The pitch isn't fit for purpose. "Obviously we can't play on it. It's something we have to deal with." Townsend, whose side sit eighth in this season's Pro12 table, admits that preparations have been hampered by the condition of their home surface. "We had two games called off from this year and two called off two years ago," he said. "It is a concern. We'll have to look at contingencies or doing something to change the surface here. ''We've not trained on grass for a number of weeks, so we have to make other arrangements. "Today, we trained at the indoor football facility at Toryglen. We've got used to it. "But our match this weekend is on a lovely surface in Paris, so we look forward to that."